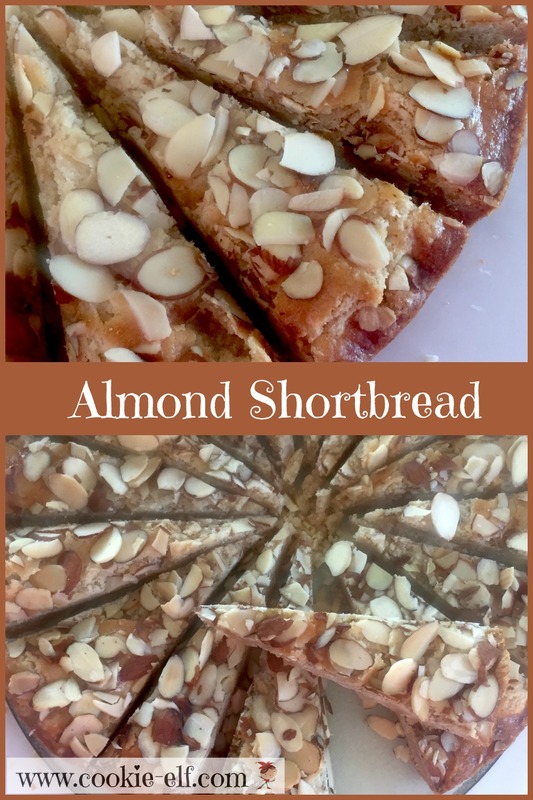 Almond Shortbread, a variation of traditional shortbread, deviates just a bit from the cookie’s time-honored ingredient ratio of one part sugar, two parts butter, and three parts white flour. This particular version is heavy on the butter. Almonds thicken the dough and make it even richer. Shortbread was traditionally formed into rounds for baking, then cut into wedges. That's why you can mimic this tradition by baking shortbread in a tart pan or spring form pan. It's easy! Use the heel of your hand or an angled spatula to spread the dough evenly. Place 2/3 cup granulated sugar and ½ cup of sliced almonds in food processor with steel blade. Pulse the ingredients until the mixture resembles coarse sand. Add butter, almond extract, and salt. Pulse until mixture is smooth and creamy. Add flour, a bit at a time, and continue to pulse to make a soft dough. Scrape the dough into a 9-inch spring form pan or tart pan with a removable bottom. Use your fingertips to press the dough evenly on the bottom of the pan. Smooth the dough surface with an angled spatula dipped in warm water. Sprinkle the shortbread surface liberally with coarse or raw sugar, followed by remaining ½ cup of sliced almonds. Use the back of a flat spatula to press almonds into the the surface. Bake the shortbread for 55-60 minutes until the shortbread is golden brown and set. Remove the shortbread from the oven. Score the shortbread surface while it is still hot. Allow it to cool completely. Remove the sides of the spring form pan or the tart pan. Use a large serrated knife to cut the shortbread into wedges along the scored lines.